It's Writing Wednesday. Sometimes, it's a good idea to get fresh inspiration from another place. 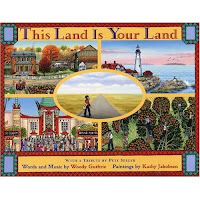 There are a lot of connections between picture books and folk songs and children's music. One person who had an important role in the rival of folk music, and in performing music for children, is Pete Seeger. Take a look below at short video on him which was a promo for the American Masters series on PBS. Then consider listening to an audio show made by the Smithsonian Institution about Folkways Records. It's a great series. Click here and you will see the menu of the podcasts which you can listen to on your computer by just clicking on the segment you want. Episode 12 is all about Pete Seeger. Episode 16 is about children's music. Enjoy, and think about the rhythm and rhyme in the music, and in picture books.